dock area along the side pads. amount of stress on the vinyl fabric. is used to cover our standard seals. recommended design for door widths 7' 4" or less. recommended design for 8' wide doors. *Beveled side pads allow seal to be mounted with backboard flush with door opening. Eliminates forklift damage to backboard. 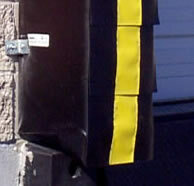 Select a dock seal projection by adding 4" to 6" to your combined existing setback and dock bumper projection. (See sketch) If there is no existing bumper or setback dimension, select the 10" projection. 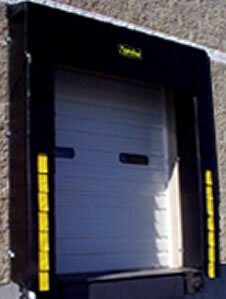 standard vertical side pads for a door opening of 8' W x 8' H.
4. Add desired special options from below - wear pleats, valance curtain and wide face header pads. 5. 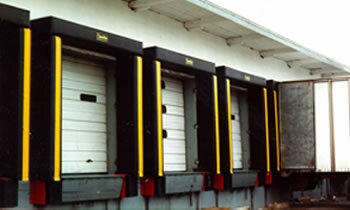 Remember to order 2 dock bumpers per seal from our bumpers section if they are not existing. on our contact page and we will confirm your dock seal selection. Click a Model No. of the item you wish to purchase. resistance. Available in 4" or 8"
door height to model # below Price w/ 8"
door height to model # below Price w/4"
- curtain hangs between side pads. opening of 8' wide x 8' high. Pads to be wrapped with 40 oz. nylon reinforced vinyl material.